...maar luister maar eens naar een ander! Ik heb al ooit in een vorig berichtje verwezen naar de podcasts van Wayne MacPhail (Medium Helvetic in Second Life). Dit keer een bekende gast in de show: Donna Dinberg, alias Dinnie Devonshire, de mede-eigenaar van mijn archivarissengroep. Een goed interview. Donna benoemt in haar verhaal bijna volledig datgene wat ik eerder over Web 3.D vertelde, vooral het deel waarin ik fantaseer - of is dat nou visie? - over de toekomst. En alhoewel we mekaar best eens spreken... hierover hebben we het nog niet zo expliciet gehad. ...but listen to someone else for a change! 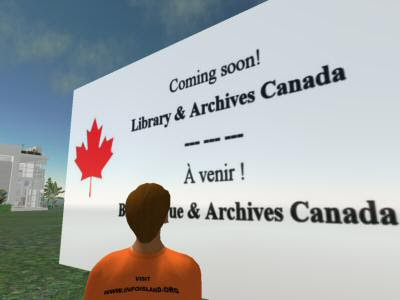 In a previous post I have already referred to the podcasts of Wayne MacPhail (Medium Helvetic in Second Life). This time he had a well-known guest on his show: Donna Dinberg, also know as Dinnie Devonshire, the co-owner of my archivists group. A good interview. Donna points out in her story almost the exact same thing as I have told you earlier about Web 3.D, especially the part about me fantasizing - or is this what they call vision? - about the future. And although we meet once in a while, we have not yet spoken about this topic.